Robert Rendall was born in Glasgow in 1898 but was of Westray parentage. 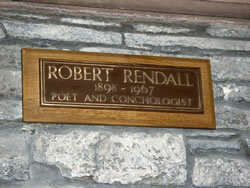 Rendall was a man of many talents and is known as a poet, essayist, historian, naturalist and theologian. A plaque bearing his name is in the presbytery of St Magnus Cathedral. He attended Kirkwall Grammar School until he was 13 and then entered the family business. He joined the Royal Navy in 1916 and served in Scapa Flow during World War I. In 1946 he semi-retired from business and devoted his life to his scientific and cultural interests, and fishing. Rendall was widely published and contributed to a range of periodicals, newspapers and societies. Classical and Norse writers are ranked among his influences.